Trust Us With Your Next Tattoo - Read Our Tattoo Testimonials! 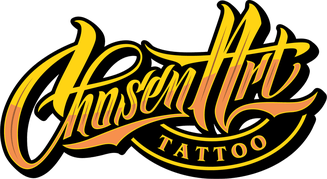 Chosen Art Tattoo prides itself on being the best tattoo shop in Glendale and throughout the state of Arizona. That is why we emphasize all of our clients to leave us a review detailing their experience with the shop staff, tattoo artists, and more. Review our tattoo testimonials below! My first tattoo and it was an awesome experience. My artist was Mat and he did an amazing job on my piece. These guys really care about the quality they put out and have great costumer service. The artists are all chill and don’t have big egos like other shops. I will definitely be returning to get more ink! Been going to Chosen for quite a while now and I couldn’t be any happier with my overall experiences. My artist was Sam Avitia and I would not trust any one else to execute the things he can do as well as he does them. Sam is so talented and so down to earth. His style of tattooing is hard to come by. Chosen is a great shop with a rad environment and talented artists. It is definitely not one of those shops that you should be intimidated by like most shops are. You will be welcomed warmly and receive great customer service(if you are deserving of it). The new shop looks incredible and the atmosphere is worth it in its own. I highly recommend Chosen Art and Sam Avitia specifically! Nothing but love for these guys. Owner, Eric, is AMAZING. His work, capabilities, and talent are out of this world with a personality to match. He is an expert at what he does and knows what he’s talking about. The quality is phenomenal, and the pricing is more than fair. He, along with any other artist at Chosen Art, delivers without a doubt. After going to Eric for my work, I couldn’t imagine going anywhere else. And I am honored to see my dad’s portrait featured on this page.